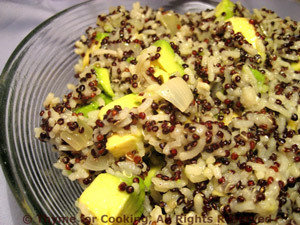 Avocado, Quinoa and Basmati Rice Salad, Thyme for Cooking healthy sides. Quinoa is very high in protein and "contains a balanced set of essential amino acids for humans, making it an unusually complete food" according to Wikipedia. The quinoa and rice cook together. Heat cooking oil in a small saucepan. Add onion and sauté until transparent, about 3 minutes. Add quinoa, rice, stock, cover and bring to a boil. Reduce heat and simmer until done and liquid is absorbed, about 15 minutes . Cut avocado, remove pit. Remove half of avocado from shell and cut into cubes. In a medium bowl, combine the oil and vinegar. Add the avocado and stir gently to coat. Add rice / quinoa, and stir gently to combine. Serve. Note: To store a cut avocado, leave in the shell, put cut side down on a plate and store in the fridge. Use within 2 days.